Explore the 'Four Gentlemen' of Chinese flowers and garden scenes from the Ashmolean collections. 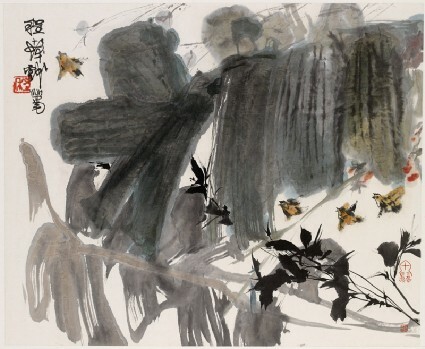 Cheng Shifa (1921-2007) acquired a reputation as an accomplished book illustrator and figure painter. However, he showed more interest in flower and bird paintings in his later years and published a volume of this genre in 1979. The three leaves displayed here [EA1995.175.i, EA1995.175.b, and EA1995.175.l] are from an album [EA1995.175] painted around that time, demonstrating looser brushwork than his figure paintings. Though generally regarded as a 'tropical foliage' plant, plantain trees (musa sp.) are widely planted in Chinese gardens. Plantain leaves have been favoured as one of the 'fourteen treasures' of scholars, as it was considered elegant to write on these leaves. It is said tha the calligrapher Huai Su (AD 725-AD 785), who was famous for his cursive calligraphy, was too poor to buy paper, so he planted many plantain trees and wrote on the leaves. The Qing Dynasty (1644-1911) scholar Li Yu also wrote poems on plantain leaves, which can be 'reused, when rain washes away the old writing.' The sound of rain drops on plantain leaves was also an important aesthetic aspect of Chinese gardens and appeared in many poems. On this painting, the vein and the smooth texture of the plantain leaves are represented by layers of wet ink, applied using the side of the brush. The highly colourful bird and flower paintings are loosely painted in the traditional mineral and plant pigments combined with ink favoured by Cheng Shifa. In the preface to a volume of bird and flower paintings published around the time this album was painted, Cheng describes the genre as a supplement to figure painting, which has always been his principal concern.